It was a sunny day in Los Angeles where Food Network Talent of The Great Food Truck Race – Sky’s Gourmet Tacos Food Truck provided FREE lunches to the first 100 lunch-goers on Friday, August 26th. Kevin Minor and Victor Burrell of Sky's Gourmet Tacos talk to multimedia producer Ed Magik, producer of Ed Magik TV, about their experience being on Food Network's Great Food Truck Race show. They also talk about the type of food they serve and the places to which they drive in order to serve their unique selection of gourmet tacos. From Fish to Filet Mignon, Sky's Gourmet Tacos serves tacos that can be compared to none. Minor and Burrell also talk about how they survive in the LA food and dining industry and how people from all over the world make Sky's Gourmet Tacos their first stop when visiting the Los Angeles area. Food Network’s Great Food Truck Race show had helped amplify Sky's presence and reputation with the public at large on a national level. 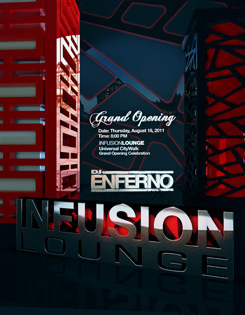 On Thursday, August 18, 2011, Infusion Lounge at Universal City Walk had its grand opening with a star-studded red carpet. Celebrity arrivals included film and television actors, plus numerous Reality TV stars. DJ Enferno, the DJ for Madonna’s Sticky & Sweet World Tour, heated up the Japanese themed club with hot dance music. The club features two distinct levels and a mezzanine. It is suitable for club dancing, movie screenings, and other type of events. The club is in close proximity to the Universal Sheraton Hotel so that guests may get some much needed rest after dancing the night away. Ed Magik TV host Pete Allman was there along with Multimedia Producer Ed Magik to video record celebrity interviews on the red carpet. Below is a video playlist for the event. Staff Sergeant Tejada received his specially modified red Camaro at the 4th Annual Wounded Warrior Car Show sponsored by WyoTech to benefit The Semper Fi Fund held August 14, 2011, at WyoTech's campus in Long Beach, California. The 4th Annual Wounded Warrior Car Show featured lots of vintage cars owned by wounded veterans. The U.S. Marines appeared to be the most represented group of veterans at the show, which also featured BMX Stunt Bike riding by Bobby Brown, an unveiling of SSgt. Tejada's vehicle, plus an awards ceremony and other acknowledgements. Ed Magik TV was there to capture portions of the even and conduct interview on video, which may also be seen on Ed Magik TV's Youtube Channel: http://www.youtube.com/edmagiktv.